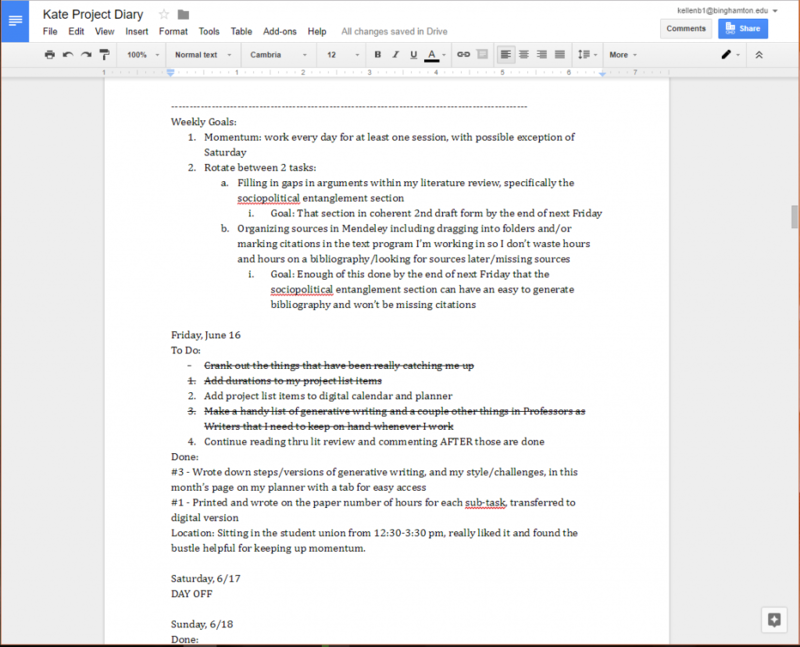 A few colleagues have asked how I organize and plan during my full-time writing schedule, so I am back on the blog explaining how I do things. This is going to be a long-winded post so be forewarned. I hear hot takes are more convincing with an infographic. Self-directed work is very individual, and I am still in the process of completing the draft of my PhD dissertation (self-imposed due date August 25), but I hope you feel reading this post is worthwhile anyway. I take a “planful” approach to writing which I’ve learned from my writing teacher, rather than feeling that planning is a waste of time which takes away from writing. Since I can remember, I have been a person who plans things. I started doing this at age 12 when I realized I am the kind of person who loses track of my belongings, tasks, and conversations without some additional help. Luckily this realization came during the gel pen craze so I had lots of tools available! 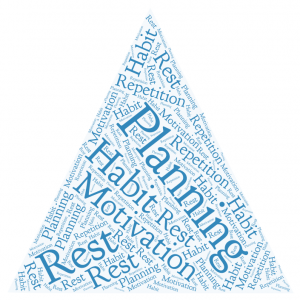 I got through high school and college with flying colors by leaning into my planning habits. Once I arrived at graduate school, my planning capabilities helped me make it through an extremely challenging first two years, but by the end of my Master’s I had lost faith in my capability to manage my own work. I stopped using a planner, annotating articles, and tidying my library regularly. Only in this past year have I begun to appreciate the importance planning had on my past success, and recognize that it is not a waste of time, at least not for me. It is not a task that takes away from my work, it helps me progress toward finishing. For the past 5 years or so I bought into the myth that academics should store their knowledge in their brains alone, miraculously bring citations to mind through sheer mental discipline, and write clearly without studying the process of writing itself. I assumed that if I could not do those things it meant I must not be a very good academic at all. After returning to planning, I find myself much more able to produce meaningful academic work. Go figure. For the last 8 months I’ve used a combination of my own tools and ones provided by the writing center at my university to keep up a daily writing habit. Now that my complete dissertation is in my sight, and all that remains is to keep doing what I’m doing. Some people prefer to write according to their final submission template (my university has a Word .docx for this) but I find this both stressful and rigid. While I am writing my draft and editing it, the last thing I need is to be reminded that eventually this must be a complete, polished, reflection of my expertise and identity as a researcher. In order to get to that point, I need to write and edit and rearrange… a lot. 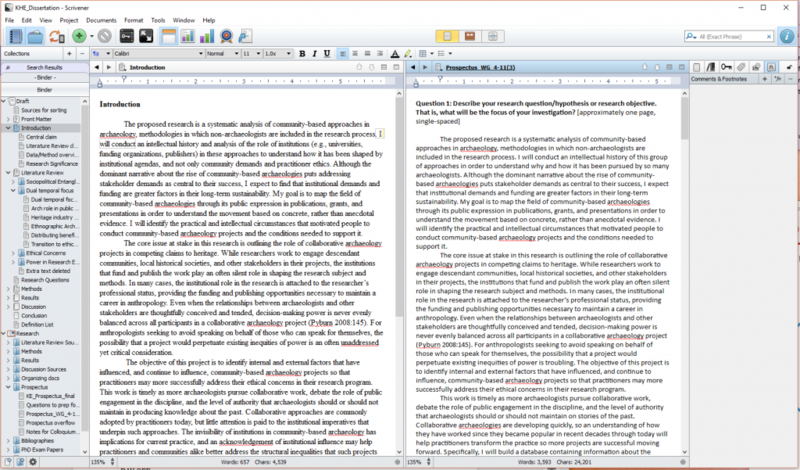 Based on recommendations from other scholars, I am using Scrivener to write my dissertation. From left to right in my Scrivener setup: My outline (table of contents), Introduction (working panel), Prospectus (right panel which I use for looking at references or sources), and Notes/comments panel. If I am easily distracted, I will only view the table of contents and the section I’m currently working on. During winter Dissertation Bootcamp (through Binghamton University Graduate Community of Scholars and the Writing Initiative) I read and re-read my zero draft and used Scrivener to break it down into individual claims, then rearranged it to reflect my best rendering of the topic. Although I often use physical note cards for this task, Scrivener’s notecard features can help you visualize your thinking process as well, and so can the sister diagramming/mind-mapping program Scapple. In my Project List, I have broken down each section of my dissertation into tasks I need to complete and how long I think they will take if I stay on task. My writing teacher calls this a “Writing Diary”. Each day you make an entry and that’s the only rule. I decided that each day I would have a to-do section A done section and a note section. Each day I have two tasks I want to do for my dissertation. In notes I write where I worked and when most of the time because I’ve been trying to find places away from home which are conducive to writing. Once a week I copy and paste items from my project list on to each day of the coming week so that I have a plan that I can stick to. By planning in advance what I want to get done I don’t have to feel like writing or think about how I should spend my time each day. I also just right how I feel and rabbit holes that I don’t want to waste time on but need to get out of my system. I don’t go back and look at what I’ve accomplished much but the process of writing things down in this document relieves anxiety that I need to plan from scratch each day or that I’ll forget something I didn’t write down. It frees up my mind and will power so I can automatically work. I make weekly and daily entries in my Writing Diary to keep myself on task. I set aside an hour or more each week to check in with my progress and assess my priorities, which is when I write the weekly goals. I try to do this every Friday after I’ve had a meeting with my writing group to talk through the week’s progress. This entry is from earlier in the summer when I was reading about the writing process as well as revising my dissertation “zero” draft. When I feel stuck, distracted, or overwhelmed, I use a Pomodoro timer on my computer. The Pomodoro Technique is a method for writing where you do short sessions of productivity with timed breaks between, which reduces the amount of time a fatigued writer sits without working. The one I use has options for 5, 15, or 25 minute timers. When I am having trouble with a particular topic, at least I can spend 15 minutes writing about it to make incremental progress, and then move on if I have not broken through the writer’s block. 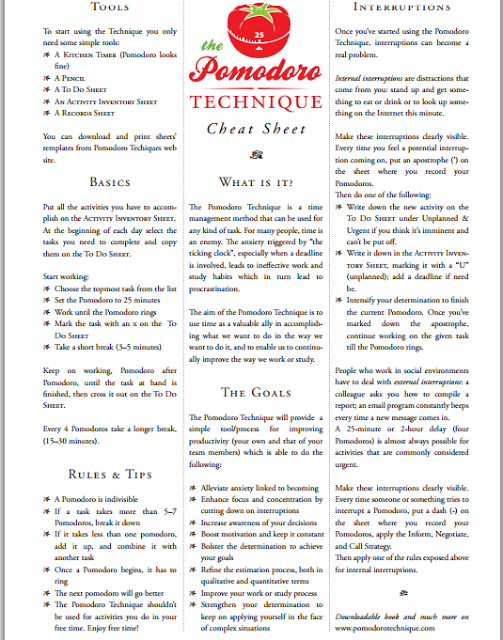 I was not interested in trying Pomodoros until I had established my specific to-do list (Project List) because the idea of choosing what I would do for 20 minutes a bajillion times a day was overwhelming, but now it works for me. It is definitely worth trying. I use the PomoDone app on my desktop, which I connected to Google Drive with a free task automation service called Zapier. I set up the connection between the two so that every time my timer stops, it logs when I stop[ed the timer, how long the session lasted, and the name of the task I entered at the beginning. I’m not sure if I’ll ever analyze that information but I like that I could. I suspect that I underestimate how long certain tasks on my Project List takes and I have the option of figuring out which tasks to set aside more time for if I feel like it. 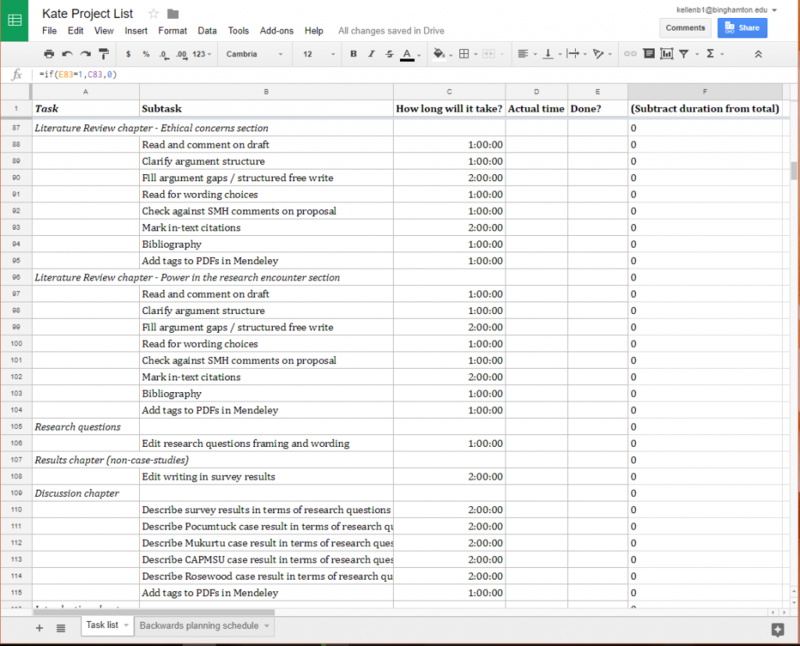 This is a Daily Tracking table based on a template by Vertex42. 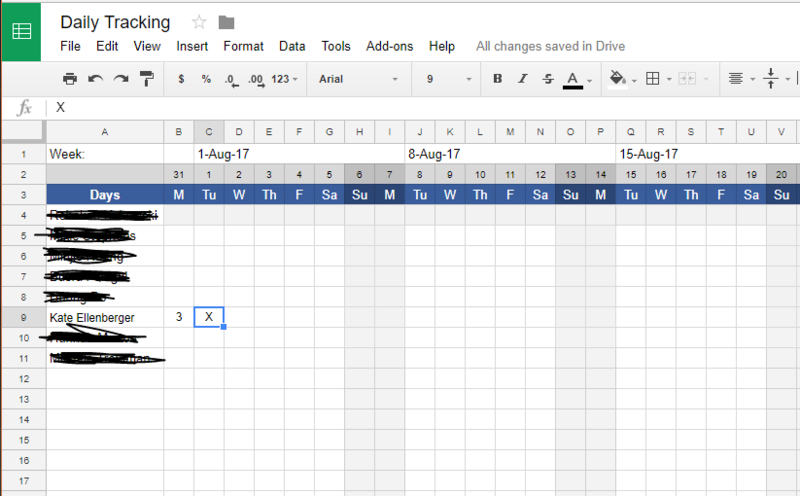 If you work during that day, you put an X or a number for how many sessions you did. Bold entries show you did a weekly planning session. This is a good low-effort way of seeing how you work and recognizing patterns. In addition to the University-organized support, I made friends with other students and early career researchers who work primarily from home and meet them about once a week for a co-writing session. Being in the same room with someone else focusing can be helpful, especially if the space is too quiet for me to work well otherwise. My third method of interpersonal support is checking in with colleagues on Twitter. Once I learned to use hashtags to my advantage, I was able to find writing buddies as well as support when I need help researching a topic. For example, I often tag my tweets #acwri (academic writing), #phdchat (phd students chatting), or #pubarch (public archaeology) depending on who I am hoping to connect with. A few years ago I discovered the #madwriting hashtag when I saw (now Dr.) Suzie Birch use it, which is one of multiple tags meant to help people find writing buddies online. Recently I also learned of “shut up and write” (#shutupandwrite #suawna for North America, #suawuk for UK, etc). There’s a robust community of heritage workers on Twitter so I’ve almost always been able to find an acquaintence who wants to write! Over the past few weeks, I’ve found a group of three other PhD students trying to finish who check in together every day, under the hashtag #phdgang, and we’ve been making good progress together. If you’re looking for writing buddies but don’t know where to start, definitely try searching these tags. Why bother with writing buddies, though? For me, it gives me positive reinforcement without consequences. I have set up enough of a structure and support group for myself that I rarely stay away from writing more than a day, but if I do, it does not waste anyone’s time (like your advisor’s if they were expecting something from you, for example) or interfere with their progress. Furthermore, I find that if I stay away from my dissertation for more than 1 full day I lose my momentum, so having a group I check in with at least twice weekly is a great help. Even if all I do is think about the topic I’m working on while cleaning the house, having my main project in mind is key to my success. Writing buddies help me keep that up. How do I plan my day-to-day schedule? Once a week I copy and paste entries from my Project List into my Writing Diary, assigning tasks amounting to about 3 hours for each day. That may seem like too little to you for someone working full time, but the point is to be able to get everything done on my list every day. I’m going for momentum here, not for writing prison. Every day I do the thing that I wrote down in my writing diary. If I don’t get something done one day I usually briefly reassign tasks for the week unless I can wrap up the next morning. Every Saturday I do not do anything related to my dissertation and hopefully nothing related to my career. If I do not make a strict day off policy I work myself into fatigue. If I get extremely frustrated and feel unable to write on another day, I check in with my plan and decide if I can take a day off to do something else. Now that I have an established habit and a guaranteed day off I don’t need this often, but I can do it without setting myself on the path to procrastination, if I know I will have another respite soon. Usually I will sew or fix something or clean the house – accomplishing something other than dissertation writing is sometimes necessary for my mental health. Part of this whole full-time writing gig for me is the exhausting task of being in touch with my feelings and progress at all times. I’m glad to be doing this but it’s definitely a different feeling than avoiding my fears and feelings about writing. Every day I confront my fear of failure head on, first thing in the morning. I’m sure my family and friends are tired of hearing about how that’s going, but they’ll surely tolerate it for a few more months. How do I maintain momentum? I do not work in long blocks and I do not wait until I feel so bad that I have to stop. I don’t want to condition myself to believe that writing is painful. (This is one of the most important pieces of advice given to me by the writing professor on campus, Dr. Danberg.) I have years of experience using the “miserable writing marathon” strategy and I don’t recommend it. If I’m working for more than an hour straight and don’t take a break then I usually don’t produce very good work or stay on topic with my writing anyway. As a bonus, writing marathons create an unhealthy cycle for me where I don’t eat or sleep enough. No thanks. Finally, I dispensed with the guilt about taking breaks and about doing things that aren’t technically writing words on a page, but which contribute equally to creating a finished dissertation. If writing my claims on some note cards and shuffling them around the table is what I need to do to figure out my literature review, then I do it. If I need to reread something but don’t want to get stuck down a rabbit hole, I will do it for 20 minutes and come back to what I was doing. I now know myself well enough to avoid the situations that fill me with regret and shame about how I spent my time. If I feel horrible, I stop writing. I recommend you do the same. You’re never going to want to write everyday if you write until you’re miserable and spend the rest of your day in the wake of it. That seems like a lot. Can’t I just write straight through and be done? Maybe you can. 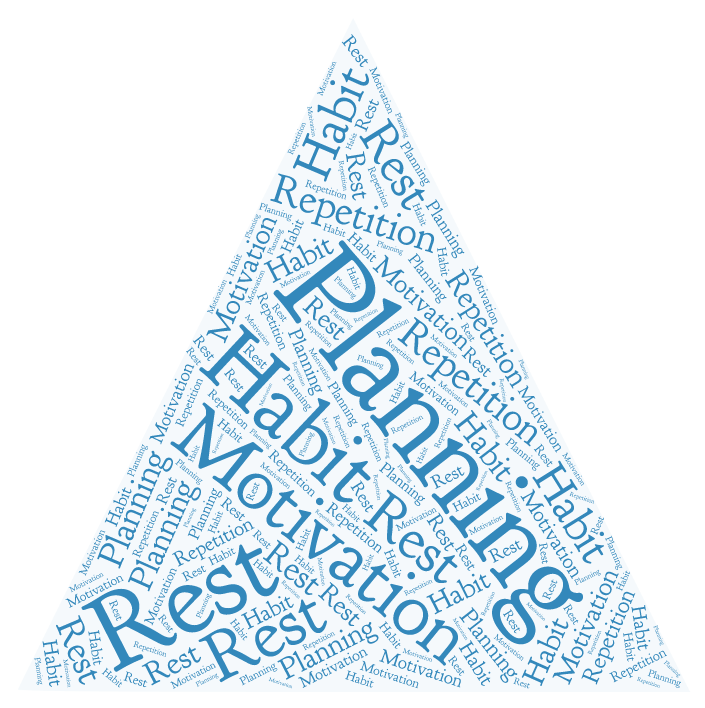 I do better work and feel better when I am (as Dr. Danberg says) “planful”. I refuse to be miserable while pursuing a career I love and care about. I also enjoy things outside of school more when I take this approach. If you want to read a much more expert opinion on writing productively than mine (and no, it isn’t a waste of time to read about writing instead of writing yourself) I have loved the book Professors as Writers by Robert Boice. It includes a self-assessment that helps you identify which advice in the book will help you overcome your specific challenges in writing. I hope at least one person who reads this will discovered that one of these strategies helps them write happier.